Methi Dal or Menthi Kura Pappu (Telugu) combines the goodness of fresh green methi (fenugreek) leaves with the nutritional benefits of tur dal. This is a delicious and healthy dal recipe where Tuvar dal is flavoured with fresh methi leaves. Fenugreek seeds are commonly used in Indian cuisine. Fresh or dried fenugreek leaves (kasuri methi) are used to flavour Indian dishes. The bitter-tasting fenugreek reduces cholesterol, prevents diabetes, protects against cancer and aids digestion. Methiwali dal is a simple yet appetising Andhra dal recipe, full of flavour and bursting with nutrients. 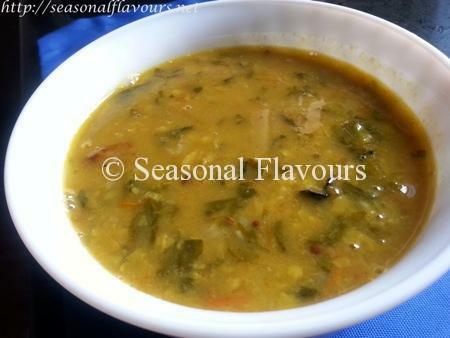 Fenugreek leaves dal recipe combining methi and lentils is a staple food at home. Just cook split pigeon peas with some fresh greens like methi tossed in for a wholesome dish. Serve methi pappu with plain rice or chappatis along with salad. 1. To make Andhra menthi kura pappu, wash the tur dal and pressure cook with sufficient water till soft. Keep aside. 2. Chop onions, green chillies and tomatoes. Wash and pick methi leaves. 3. Heat ghee in a frying pan and temper with mustard seeds and cumin seeds. Toss in curry leaves and broken red chillies. Fry for half a minutes. 4. Add chopped onions, green chillies and crushed garlic. Saute for a minute till the onions turn translucent. 5. Add methi leaves sauté for 1-2 minutes. 6. Tip in the chopped tomatoes, add turmeric and cook till the tomatoes soften. 7. Add the cooked tur dal and salt. Mix well. 8. Simmer for 3-4 minutes and remove methi pappu Andhra style. 9. Serve Menthi kura pappu with hot rice and a dollop of ghee. Enjoy delicious Andhra style Methi Dal – lentils cooked with fenugreek leaves. If you are searching for more fenugreek recipes, do try out Methi Aloo, Stuffed Methi Paratha and Methi Matar Malai. South Indian Methi dal is a wholesome and healthy methi leaves recipe where lentils are cooked with fresh fenugreek leaves. Tasty Andhra Style Methi Pappu recipe is good for diabetics. To make methi leaves dal, slit the green chilli, finely slice the onion, chop the tomato and slightly crush the garlic flakes. Wash and pick the methi leaves. Wash Tur dal and pressure cook until the dal is well-cooked. Once the pressure is released, remove lid, mash dal well. Heat ghee in a pan and add whole red chilli, curry leaves, mustard seeds, cumin seeds and fry for 2 minutes. Add slit green chilli, sliced onion, and lightly crushed garlic. Stir for 2 minutes until the onion turns translucent. Add methi leaves and fry for 2-3 minutes. Add chopped tomatoes and turmeric and cook covered till soft. Pour in the cooked dal. Mix well and add salt. Simmer for 3-4 minutes and remove. Serve South Indian Menthi Kura Pappu with steamed Rice or Rotis. * To reduce the bitterness of Fenugreek leaves, sprinkle a little salt over them and keep aside for 10-15 minutes. Squeeze the leaves and wash in water. * A variation of this recipe is to heat oil in a pressure cooker and saute chopped onions, garlic, green chillies, methi leaves and tomatoes. Add the dal and turmeric and pressure cook till soft. Open the lid, add salt and bring to a boil. Heat ghee in a pan and add whole red chilli, curry leaves, mustard seeds, cumin seeds and fry for 2 minutes. Add this Talimpu (Telugu for tempering) to the dal. Shil is a freelance writer, professional blogger, foodie, health advocate and travel enthusiast.